The optional Snow Thrower Attachment makes your DR Field and Brush Mower a 4-season workhorse. Throw snow off long driveways and walkways with our single-stage, 30"-wide Snow Thrower Attachment. With our powerful engines, there is plenty of power for the auger to quickly chew through dry or wet snow, and towering snowdrifts! We offer a full set of attachments that allow you to get even more use out of your DR Field and Brush Mower. Watch the video above for an introduction to each. No need for a lot of tools or time. Switching attachments is a no-hassle process that you can do in just a minute or two. It’s as easy at it looks in the short video above. Our Snow Thrower Attachment operates like a 2-stage with all the conveniences of a single-stage. Lighter weight makes it easier to handle. Easy on/off design makes attaching easy (less than 5 minutes). Clears a 30" wide path. Discharge chute rotates 230 degrees and is easily controlled from the operator's position. Optional Headlight for early morning or evening work. Adjustable skid shoes raise and lower the auger height. Throws snow up to 30' away. Simple design, unlike 2 stage snow blowers. Rigorously tested and proven here in Vermont! Please call toll-free 1-800-687-6575 if you have questions. We bought this blower to clear a path through our back field to the sheep shed. Our back field slopes gently downhill west to east and the entrance to the field is at the lowest point. This blower works great going downhill but it is a nightmare trying to go uphill with it. The wheels don't grip, even with chains on them. Takes a lot of pushing and moving back and forth, up and down, forward and reverse, to get up the hill. Would not recommend this product for use on a hill! i have had the blower attachment on the 17hp kawasaki unit for over 10years. when the blower was new the shear bolt failed frequently. lets say every hour or so. as the unit broke in it got better, haven't had one shear in 3 years. THe power head with the blower on it is a long unit. maneuverability is not as good as a standard snow blower. it is more suitable for larger spaces. 2 to 3 stall drives and longer driveways. This is a single stage blower, (most dedicated snow blowers are 2 stage, a fan in the chute helps to throw the snow. usually much less power than the DR) therefore it depends on RPM's to throw snow. 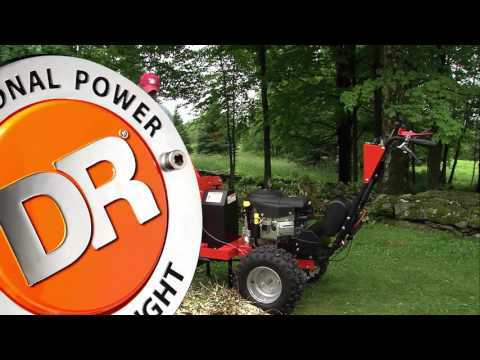 In order to get the motor to advance its power you need to put a load on the blower auger. In light powder of 2 to 3 inches you will need to go faster to get the motor to power up. In heavier snow slow down and let it work. The blower will throw snow 30 to 40 feet. Look at snow blowers in terms of power to inches of chute. my DR has 17hp on a 30inch chute. you would find the dedicated blowers at 10 to 12 hp on a 30" chute. Many are under powered. It is always best to take a smaller "bite" in heavy and or deep snow so you are not overworking any snow blower, and a bigger bite in light fluffy snow. On the over all My DR blower is very good for larger areas, a bit of a challenge in smaller spaces, very good with medium to heavy snow, a bit of a challenge in light 2 to 3 inch snow due to the need to put a load on the motor to advance the power. Response from DR SupportThank you for taking the time to write a review! We love hearing how our product is standing up to the test of time! You can email your video to Info@DRPower.com Again, thank you for the review! well my only problem so far has been the tension pulley on snow blower, never had any problems with the blower in dry snow, but wet iced up snow is a problem, better to use it before it freezes, I never had a pulley to split down the middle before, do not know it after two storms with two feet of snow has done it in on the tension pulley, but I would thought that the shear pin would have sheared if the snow was to much for it, I always use it in first gear and take half of the 30" wide of snow so not to over do engine speed. would be nice if it had a slower speed than first gear does for snow, almost to fast for two feet of snow blowing.I would say this , the engine is a great engine for the 2006 model 17 HP, If kept tuned and maintain it always runes great, I used the Dr engine with my brush mower,lawn mower 42"deck and the snow blower, the only thing I would say is bad about snow blower is that it will beat you up if you are using it on a mountain road that is not flat, turning and backing up are harsh on a 57 year old man, I feel it for two weeks after ever time I use it in the snow, I have 300 feet of drive way, that why, better to have a tractor if you got the money for one. Response from DR SupportThank you for providing feedback on the DR Snow Thrower Attachment. In looking at your customer file we see that you've had the attachment since 2012 and based on your nice feedback it appears that the Snow Blower has been a useful tool. As you likely know we have knowledgeable Tech Support Staff who are always happy to assist you and as well now have a terrific customer support resource located right on our web site. Check it out at www.drpower.com/support. Here you can find replacement parts, cost and are able to order what you need there. Keep in mind that we recommend you use the Brush Mower whether on its own or with an attachment on slopes no greater than 20 degrees. Thank you for choosing DR Power - we really appreciate your business! Here is a video of me clearing the 60' x 65' pad in front of the garages. I found very few videos on youtube demonstrating this product so here's mine in action. https://www.youtube.com/watch?v=nX9fKoZX-ZQ I am using the attachment on a 10year old 17hp model, the thrower was a beast through the deep snow that Jonas Blizzard brought the east coast. Keep in mind, this is in 20-40mph wind gusts of the blizzard. For the record, i did lose one sheer bolt and the belt popped once during the entire 3 day snow blowing term. The machine successfully cleared 8 total driveways, 3 of which are over 1/6 of a mile. Q.What are the incline limitations going up and down? A.Hello, the Field and Brush Mower is not recommended to be used on inclines that exceed a 20 degree grade. This is for the safety of both the operator and the unit itself. When using the unit with the Snow Thrower Attachment, you will need to be extra careful on slopes, staying aware of traction and other hazardous situations. Please let us know if you have any other questions. Q.Does this have to ship to a depot, or can it ship to my house via UPS? Thanks! A.Thank you for your question. This will ship via freight, not UPS, due to its weight. It can be shipped to your home as long as your home is accessible for a full-size tractor-trailer to get in and out. Please feel free to give a call and we can help set up shipping and answer any other questions you may have.